As technology progresses, many new machines are being launched with SSD drives rather than old fashioned spinning hard drives. That’s great if you’re in the market for a whole new machine, but for those of you that aren’t, there is an upgrade path available to you right now. CHNO can replace your internal hard drive with an SSD equivalent, increasing performance massively and extending the life of your existing machine. There are a raft of benefits to SSD; but the biggest difference you are likely to see is that these drives are just so much faster than non-SSD equivalents giving your machine a much appreciated performance boost. Not only that, with man Macs it’s possible to remove the internal Optical Drive (DVD burner) and replace with either a 2nd SSD or your original hard drive (for backup or additional storage). Creative users with large data throughput requirements (photographers, videographers, grapic designers, illustrators etc.) will see a huge increase in productive time as the non-productive time you spend waiting for your machine to open and close files is reduced dramatically. SSD is short for Solid State Drive. Older storage consists of one or more spinning disks and magnetic head (think of a tiny record player) to store your data, enclosed in a thin enclosure. SSD however, has no moving parts, and because of the media it uses, even in its slowest form, is typically capable of much higher throughput of data than spinning hard drives (by anything from 25% to 400%). This means that boot time is significantly reduced, files are read and written much, much quicker and your machine will generally feel so much snappier. But the advantages don’t end there. Because there are no moving parts, less power is required and less heat is produced, giving your notebook a slightly increased battery life. Additionally, the lack of moving parts makes the failure rate of SSD’s much better (by around 25%), reducing the risk of data loss from failing disks. We have to mention that these advantages do have some drawbacks; SSD technology is still more expensive than legacy hard drives, and large drives are not available yet (500Gb SSD’s are the largest we recommend right now). And because of these factors, SSD will not suit everybody and every machine. Call us to discuss your requirements, and we’ll guide you in the right direction based on your personal needs. 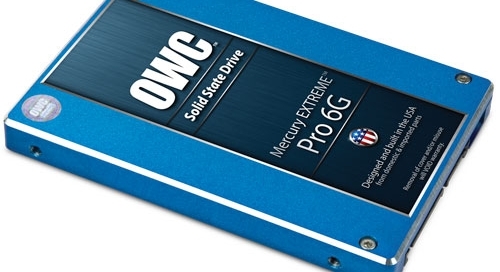 CHNO actively sell the OWC range of SSD’s as our experience shows that these are the best performing, and most reliable, drives on the market. Prices start at £139+VAT (240Gb drive), but we strongly recommend you speak to us to ensure you get the right product for your needs.